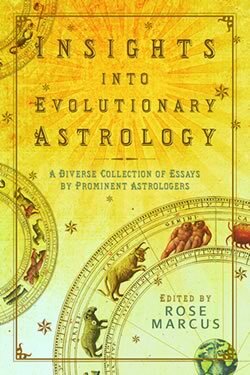 Insights into Evolutionary Astrology is a collection of essays written by top astrologers from the Jeffrey Wolf Green school of Evolutionary Astrology. The book begins with a discourse on the nature of the Soul by founder Jeffrey Wolf Green. His chapter succinctly describes the four natural evolutionary momentums that propel the Soul’s growth. Deva Green, Jeffrey’s daughter, has elaborated on these four momentums in her chapter “From Cataclysm to the Awakening of Latent Capacities” with detailed examples, such as Barack Obama’s compelling political rise to the White House. Jeffrey Wolf Green also outlines for us the how the Soul evolves through the creation process of necessity and desire, or in other words, fate, karma, and free will. Along with a dissertation of the various evolutionary conditions, Jeffrey describes the core principles of natural law, and details how exposure to societal norms and man-made laws have progressively shaped, and conditioned the evolving ego. These key points provide a foundation for an expanded understanding of how the astrological archetypes may be funneled into expression at any given time. Recognizing that each one’s consciousness will progress at differing development rates, Jeffrey Wolf Green taught that it was a crucial first step to determine the evolutionary state of the chart in question. Astrology is a study based in observation and correlation. Basic information gathering such as family relationship details, religious, socio-economic and cultural backgrounds, along with independent observation and chart correlation provide an essential starting point. The evolutionary state must also be taken into consideration. Kim Marie’s chapter on Evolutionary States offers an excellent in-depth demonstration of this basic criterion. Sexuality, the root of our instinctual self, is one of the core ways that evolution is advanced. In his chapter, Maurice Fernandez provides an overview of the sexual dynamics of each of the twelve zodiacal signs. He first describes the intrinsic qualities of the purely biological dynamic correlated to the soul’s intent for evolution through each one of the archetypes. Next, he describes how the influences of progressive socialization, with its consensus morality and sexual politics, adds complexity to the natural selection process and how these factors can easily create distortions in the behavior responses of each of the signs. Astrologers have often been challenged to determine how two people with similar charts can have such dramatically differing ways of expression and of creating their experiential realities. Kristin Fontana demystified this topic in her chapter “Twins – Similar Charts, World’s Apart”. Past Life Therapist Patricia Walsh has combined her work in Deep Memory Regression Therapy with her study of Evolutionary Astrology. She has spent many years gathering and documenting actual case studies, and has amassed an impressive collection that readily validates the core principles of Evolutionary Astrology and Jeffrey’s specific methodologies. The examples in her chapter include demonstrations of “skipped steps”, another key notable of Jeffrey’s techniques. Her case studies demonstrate how an individual will continue to work through a central or core dynamic from lifetime to lifetime, but how the evolving dynamics can be approached through a range of angles. Patricia Walsh’s marriage of these two fields of study distinguishes her work as truly pioneering. While the moon’s nodes are commonly included in chart delineation, the nodes of the planets have been largely overlooked. Moving very slowly over great lengths of time, note that the planetary nodes for Jupiter through Pluto occupy the approximate same degrees for all of us born in this century. The planetary nodes provide a background link to our bigger picture collective experience and evolutionary journey. A look at the planetary nodes through natal chart contacts, by house positions and aspects, will demonstrate how this bigger picture information animates within our individual psyche fabric. In chapter seven, “Time’s Arrow”, Mark Jones simplifies what can be often viewed as a daunting topic and provides a valid case for why planetary nodes should be added to your astrological research. The final offering in this book is my own chapter on the archetype of Capricorn, the predominate archetype that will dictate our personal and collective reality through 2024. Correlating to our conditioned consciousness, to our social, economic and political landscapes, to time marking and to reality itself, this archetype is an important key to our astrological understandings. This chapter includes a full discussion of the Capricorn archetype, a discussion of Pluto’s transit through Capricorn, the upcoming Cardinal Cross transits that will ignite and intensify Capricorn’s influence. Also included is a brief look at the geodetic regions that will be animated by Pluto’s tour through Capricorn. Insights into Evolutionary Astrology is available through Amazon.